As I announced, Adalyn Grace made her way into the world on September 20th! We are overjoyed with her and enjoying every moment being her parents. 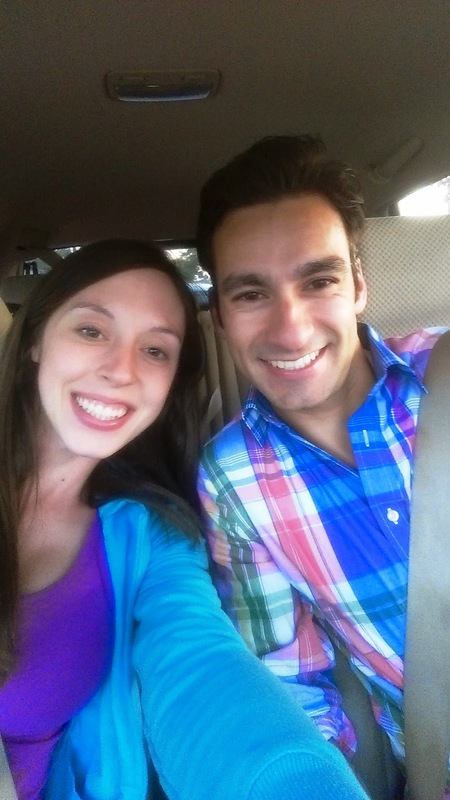 As I love to read birth stories, I wanted to share Adalyn's story with you all. 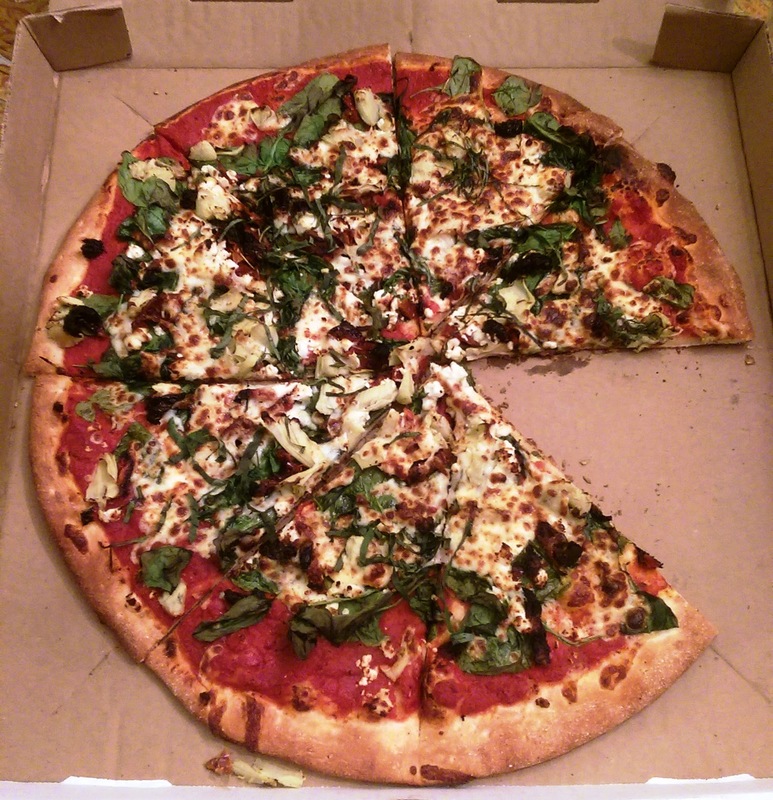 Awesome pizza right before labor started! It all started on Thursday, September 18th after a day of lots of walking (6 miles total broken up into a few walks), spicy Thai food, pizza at my parent's house and a little procedure at the doctor's office. I was 1 1/2 cm dilated at this point and 50% effaced. Adalyn was 1 day overdue at this point. At 9 PM that night, some moderate cramping started. I fell asleep for an hour and then was up the rest of the entire night with contractions. I used a contraction timer app on my phone and found out that the contractions were 2-5 minutes apart lasting 30-45 sec. My pain was about a 3-4 at this point. I was shocked that they were so close together right from the beginning since from what I have read, they are usually more spaced apart in the beginning. I was very uncomfortable laying in bed so I went downstairs, threw in a load of laundry, loaded dishwasher/ran/put away and tidied the house. I was not sure what to do exactly as it was 2 AM. At 4:45 AM, I woke Troy up and let him know about the contractions and my pain was about 4-5. At 5:15, I took a shower then sat in the bath for awhile. This helped to distract me from the pain. At 6 AM, I answered some blog emails : ). To help get things going even more, I took the dogs on a 2.5 mile walk and continued having contractions the whole time. I was that crazy person who went to work while in labor. 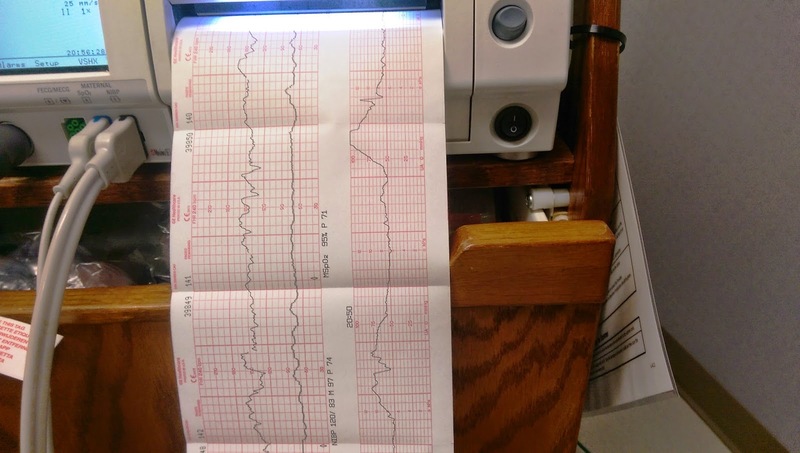 From 9:30-10:30 AM, contractions became less frequent. I was not feeling well (duh!) and left to go home. I took a short 45 minute nap at home and then woke up with painful contractions. I could not stay in bed any longer and got up to have lunch. 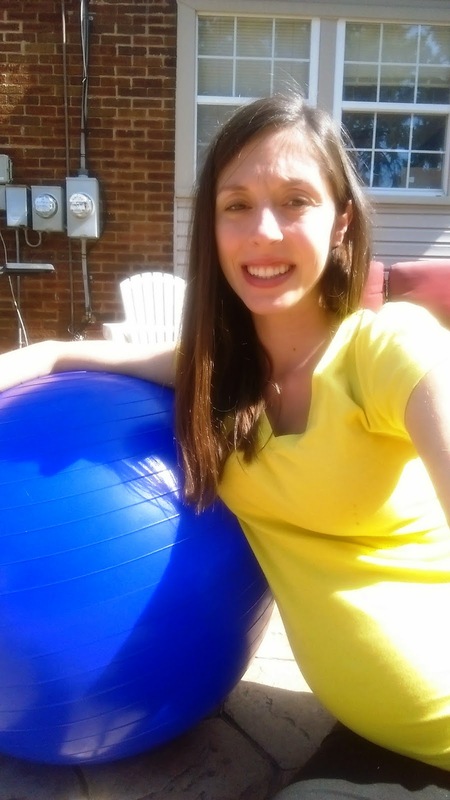 Laboring next to and on my yoga ball outside- that smile is so fake- I was in a lot of pain! From 12-1, I labored outside on my yoga ball and pain was still at a 4-5. I knew that I was in early labor but did not know if I had progressed any. At 2 PM, I went to my scheduled ultrasound to check to make sure my amniotic fluid levels were okay. I asked to speak to a nurse and said I was having contractions. A doctor came to see me instead and told me that I was 4-4 ½ cm dilated and 90% effaced. The doctor said I am in labor and am going to need to go in to the hospital tonight! He even recommended in the next hour or two. I was so excited that my body had progressed so much. My mom drove me home and I told Troy right when work ended to come home right away. We went on a walk together and hung out for awhile while the contractions continued. It felt so strange being able to talk about such normal things while in labor. I wanted to wait as long as possible to go to the hospital so that I could progress in the comfort of my own home. I knew we should eat dinner and got some stuffed pepper soup from my mom. My dad stopped over for a few minutes and wished us luck. I could barely eat as my pain increased. We left for the hospital at about 7 PM or so and went to St. John Hospital to the labor and delivery floor. They got me hooked up to a contraction monitor and started to monitor my contractions. They were coming regularly! The resident doctor came in to check my progress and sadly said that I was only at a 4 1/2. From 2:30-7:30, I had not made any progress. I was so disappointed. My blood pressure was strangely running high so they would not let me move and made me stay in the bed to monitor. It was normal after a few attempts. I think I was just very anxious. They told me that they would give me an hour to progress and then would call my doctor to see what he wanted to do. After an hour, I sadly made no progress. I was so upset as I was having so many contractions and my pain was at a 6 or so at this point. I knew that I would not be able to sleep and did not want to be sent home. Unfortunately, my doctor told the resident to send me home. They told me to take benadryl to help me sleep and tylenol to help with the pain (haha, yeah right). Troy and I both felt so defeated and walked back to our car. We went to pick up our dogs from my parent's house and that is when the real pain set in. I was sitting and talking when I was suddenly in so much pain that I didn't want to sit down. I started to cry for the first time in 24 hours of straight contractions. From then on, the pain was a lot more intense and continued into the night. Can't wait to read the rest! I love that you walked/worked through the first part!! !